Rascal Flatts performed at the Grand Ole Opry on Dec. 14 to wrap up their year-long celebration of their 10th anniversary year. 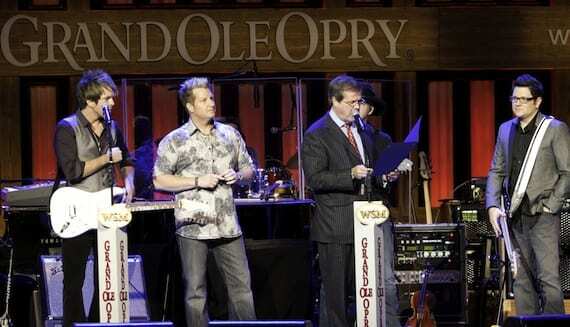 Nashville Mayor Karl Dean presented the band with an official city proclamation to recognize the band for their charitable endeavors and honors, including the Jason Foundation and the Monroe Carell Jr. Children’s Hospital at Vanderbilt, where they were recently honored by the naming rights for the hospital’s only pediatric surgery center, “The Rascal Flatts Surgery Center.” The proclamation also stated additional efforts as previous recipients of the “Shining Star Award” by the Make A Wish Foundation and the Nashville Symphony’s Harmony Award, as both honors took place in Nashville. Three Music City Media artists, including Matt Gary, Jeremy Parsons and Glen Templeton participated in the 28th Annual Christmas4Kids Tour Bus Show. The annual celebrity tour bus event was held December 13 and featured meet and greets and 75 tour buses on display in the Hendersonville Walmart parking lot to benefit families in need during the holidays.